We know what you're thinking. Another Chevelle at SEMA. Wait now. This Chevelle kicks out 1000 horsepower without a blower, the bottle, or burning one drop of gasoline. How? Propane! The small block Chevy under the hood huffs down the same stuff folks use to heat up their Hamburger Helper. Since propane packs a 100+ octane rating, using high compression pistons is not an issue. We had a chance to hear this beast run at Mother's over the summer and it sounded much better than mean. This is the Chevrolet Hank Hill would use to show Boomhauer and his Mopar the tail lights. Press release after the jump. The team from Mothers Polish has another cool ride to add to its already impressive fleet of hot rods, customs, race cars and big rigs. It's the ultimate symbol of Chevy muscle, a 1970 Chevelle SS. But this build is more than just your average overhaul — it's resto-modded with pro touring in mind, and produces over 1,000 clean-burning propane-fueled horsepower without the aid of boost or nitrous. The concept of ProPane was developed by Jim Holloway of Mothers Polish, designed by Chip Foose, and brought to life at Paul Gonzalez Custom Cars, who managed the build. A talented team of expert fabricators, suppliers and other friends of the Mothers family were recruited from throughout the automotive aftermarket industry and worked tirelessly until its completion. ProPane sports a unique tube chassis by Obrothers Design, which mates to an innovative inboard pushrod coil-over suspension dampened by Penske 8300 racing shocks and sports one-off Foose Design wheels and Pirelli P Zero rubber. Thinking forward as well as "green," the ProPane's groundbreaking power is provided by a large-displacement Haigh Blocks small block motor with Propane Performance Industries fuel delivery managed with with a Link ECU. 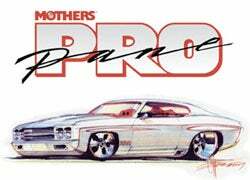 Any way you look at it, the Mothers ProPane is unlike any other hi-po Chevelle. Previewed earlier in the year with a developmental engine, the completed ProPane makes its world debut at the only place that seems fitting — the SEMA Show 2007.